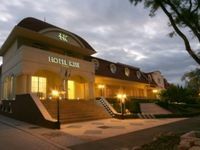 The four-star Hotel Kiss**** welcomes its Guests with 47 rooms, 3 conference rooms and with customary family atmosphere. For the sake of our Guests' comfort we have wellequipped, air-conditioned rooms with bathromm, hairdryer, telephone, LCD television, Internet access, safe and minibar. We have special rooms for our disabled Guests, too. In our Borostyán Restaurant rich buffet breakfast will make your mornings more plesaurable. For lunch and dinner everyone can choose from an assortment of authentic Hungarian- and international cuisine, too. Our quality wines have been selected from the best Hungarian vieners. In our Vanília Café we serve coffee-, tea- and coctail specialities. Our hotel offers a luxurious blend of facilities to make sure that Guests enjoy their stay with us. Why don't you try our indoor spa, wet and dry sauna, massage therapy and beauty salon to make your day unforgettable? For recreation, bask in the warm sun in our lush garden, cool off in our outdoor swimming pool and have an invigorating workout at our badminton court or play chess just to relax. And Kids are welcomed in our playground area. Our air-conditioned conference rooms are suitable for different trainings, cocktsil parties, receptions, exhibitions, ocassions. Our dedicated staff, latest technical equipment and outstanding service are the guarantees of a successful event. • Pets are allowed for an extra charge of 4200 HUF per day. The prices contain the accommodation with buffet breakfast, the usage of the wellness part (swimming pool, dry and steam saunas), the billiard room and table tennis and the children playroom, room safe, free Internet access, the parking place, and VAT. If you think any one of those points is true to you, then here is a good occasion to come and visit HOTEL KISS****, in Tata, "the home of living waters'"
Our package can be reserved from the 1st of September until the 30th of November, for a minimum of 2 nights! Children over 16 years of age are considered adults! Our package does not contain the tourism tax and the parking fee. Prices are in Forint and include the VAT. - our outside Wellness area is available between June and September. - Erzsébet Voucher and Erzsébet Gift Voucher (only accepted for food and drink items in the Restaurant). Reservation is conditioned upon 50 % payment in advance. Please make sure that you always provide accurate contact and payment information. We send you the necessary information for the payment in our acknowledgement. Reservation is only valid after we have received the advance payment, the rest of the bill is to be paid during your stay. In case of individuals cancellation is possible until the 5th day before arriving, in which case we pay back the money paid in advance or we can count it towards your next stay. In case you cancel in less than 5 days before arriving, we bill you for the first night. The long weekend of october! Our offer is available for a minimum of 2 nights between the 19th of and 24th of october 2018! •	Smorgasbord buffet breakfast and 3 course half pension dinner. Our offer can be booked for a minimum of 2 nights between 20th and the 23rd of october. The displayed prices contain the VAT! The room can be taken at 14:00 on the day of arrival and must be vacated by 10:00 on the day of departure. After leaving the room our guests can still use our wellness area free of charge while we provide a safe room for their luggage! We accept Erzsébet voucher and Széchenyi (SZÉP) card too (OTP, K&H, MKB)! The reservation's condition is a 50% advance payment. In case of a reservation please provide us with a billing address. The information required for the bank transfer will be provided for you in the confirmation letter. A reservation will be valid only upon the arrival of the payment. The rest of the bill will be payed during your stay. Reservation cancelling can be done until 5 days before the arrival date without any penalty, in wich case the advance payment will be fully refunded or taken into account for a future reservation. After passing this threshold we will charge one night of accomodation as penalty.